Sahure's pyramid as seen from the causeway. The Pyramid of Sahure was the first pyramid built in the necropolis of Abusir, Egypt. 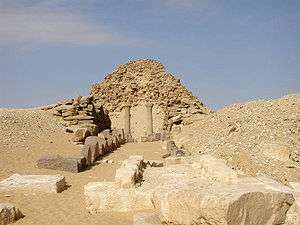 The pyramid was constructed for the burial of Sahure, second pharaoh of the fifth dynasty c. 2480 BC. Sahure's pyramid is part of a larger mortuary complex comprising a temple on the shores of Abusir lake, a causeway from this temple to the high temple located against the main pyramid and a separate cult pyramid for the Ka of the king. The complex was known in ancient Egyptian as Ḫˁj-b3 S3ḥ.w Rˁ, "The Rising of the Ba Spirit of Sahure". The pyramid complex of Sahure was extensively excavated at the beginning of the 20th century by Ludwig Borchardt and is now recognized as a milestone in ancient Egyptian tomb architecture, its layout defining a standard that would remain unchanged until the end of the 6th dynasty some 300 years later. The valley and high temples as well as the causeway of the complex were richly decorated with over 10,000 sq. m (107,640 sq. ft) of fine reliefs that made the complex renowned in antiquity. The high temple is also remarkable for the variety of building materials used for its construction, from the alabaster and basalt floors to the fine limestone and red granite of the walls. The first investigations of the pyramid of Sahure were undertaken in the mid 19th century by John Shae Perring and Karl Richard Lepsius who included the pyramid in his list under the number XXVIII. These investigations remained superficial however and no serious excavations of the pyramid took place at the time, due mainly to its state of ruin. The pyramid was entered for the first time a few years later by Jacques de Morgan but he too did not explore it further. During the excavations, Borchardt discovered the still largely intact architrave of the high temple as well as a group of palmiform columns. 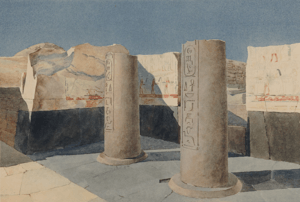 He sent some of these columns for exhibition in Germany as was customary at the time, while the rest stayed in Egypt. The columns sent to Germany were to be displayed in the Egyptian Museum of Berlin. However, because of lack of space the columns and other findings from Borchardt's excavations were not displayed before the 1980s, when they were showcased for the first time in the old stables of the Charlottenburg Palace. More recently these were moved to the Pergamon Museum. Borchardt's work was very thorough and a further survey undertaken by Vito Maragioglio and Celeste Rinaldi in the early 1960s yielded no fundamentally new results. The pyramid of Sahure is smaller than Userkaf's and stood less than one third the height of the great pyramid at the time of its completion. In the mean time a comparatively greater emphasis was put on the construction of the mortuary temple and its decoration. The pyramid complex was completed during Sahure's lifetime as witnessed by reliefs of the causeway discovered in 1994 and showing the ritual celebrations accompanying the completion of the pyramid. Sahure's mortuary complex is oriented on an east-west axis and comprises all the standard elements of a mortuary complex: a valley temple located on the shores of the Abusir lake linked to the main enclosure via a long causeway and, within the enclosure wall, the main pyramid, the high temple and a smaller cult pyramid. Remarkable is the absence of peripheral burials for the members of the royal family. Indeed, no mastaba or pyramid of a queen dating to Sahure's time has been discovered as of 2012 in the immediate vicinity of Sahure's pyramid. This is in rupture with a tradition dating back at least to pharaoh Sneferu and that would be followed by Sahure's successors. Consequently, Sahure's consort queen Meretnebty, is only attested through carved reliefs found in the high temple. The reason for this absence is unknown. The complex also lacks a northern chapel located close to the main pyramid entrance. However this type of structure was unknown at the time of Borchardt's excavations and any existing sparse remnants may thus have remained undetected. 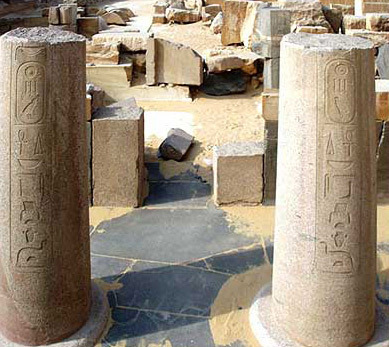 Sahure's valley temple was located on the shores of Abusir lake. It was rectangular in plan, being 32 m (105 ft) long and 24 m (79 ft) wide, and oriented on a north-south axis. The base of walls of the temple were carved with concave molding and the corners of the temple were rounded. The valley temple is now in ruins and partly obscured as it has been buried over time by up to 5 m (16 ft) of sludge deposits from the lake. It is nonetheless considered the best preserved valley temple of Egypt after that of Khafre. 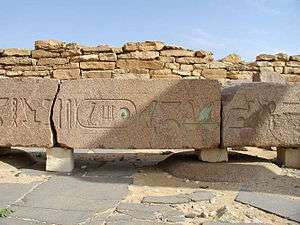 A 235-metre-long (771 ft) causeway connected the valley temple of Sahure's pyramid complex to the high temple. The causeway was roofed, its side walls, ceiling and flooring being made of limestone slabs, some of which are still visible today. In between the ceiling slabs were narrow slits allowing natural light to penetrate the ensemble. The walls of the causeway were covered with painted reliefs throughout, some of which were discovered during the excavations started in the mid-1990s of the upper part of the causeway. These include representations of the king as a Sphinx trampling over his enemies, a procession of enemies being led by gods, depictions of the bringing of the pyramidion to the main pyramid and of the ceremonies following the completion of the complex. Sahure's mortuary temple represents the definitive prototype for all later pyramid temples of the second half of the Old Kingdom. For the first time, the funerary and sacrificial temple are no longer separated but rather integrated together in a continuous east-west arrangement within the complex. The ensemble was built of and clad with fine Tura limestone and extensively decorated and worked throughout. Here again, the base of walls were carved with concave molding and the corners of the temple were rounded. 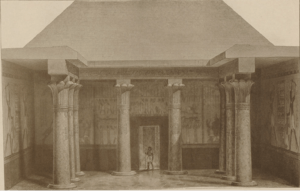 The pyramid courtyard was accessed either from the transverse corridor or through the side entrance of the mortuary temple via a portico with two round columns bearing Sahure's name and titles. No building seems to have stood in this courtyard. At the base of northern side of the pyramid was a passage leading to a T-shaped underground chamber, oriented on an east-west axis and under the tip of the pyramid. No artifacts were found onsite during the excavation of this chamber which might have housed a statue of Sahure's Ka. The base of the pyramid has been heavily damaged through stone robbing and the dimensions of the pyramid are difficult to ascert with certainty. According to Borchardt, Sahure's pyramid originally reached an height of 90 royal cubits making it 47 m (154 ft) high with a base of 150 royal cubit, 78.75 m (258.4 ft), and a slope of 50°11'. The architects of the pyramid made a sizeable error when delimiting the base: the southeast corner of the pyramid is 1.58 m (5.2 ft) too far to the east. 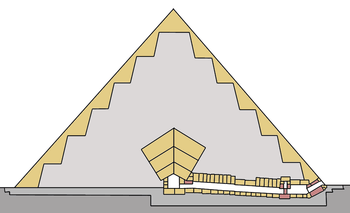 The pyramid is consequently distorted, although much of the distortion, being on the eastern side, is concealed by the adjacent mortuary temple. Unlike the pyramids of the 4th dynasty, the pyramids of the 5th dynasty were not built on the local bedrock but rather on a foundation made of two thick layers of limestone blocks. Although the foundation of Sahure's pyramid is not accessible and has thus not been examined, archaeologists believe that it was constructed according to the same technique. The pyramid core masonry consists of low-grade roughly hewn limestone blocks from local quarries. The spaces between the blocks were filled with rubble and mortar. The blocks were laid in horizontal layers constituting 6 steps which then received the white limestone cladding. Just as for the cult pyramid, this construction technique is responsible for the current ruined state of the pyramid. The substructures of the pyramid were built in a T-shaped open ditch reaching to the foundation layer and left open to allow for simultaneous works on the pyramid foundation and core. The ditch comprised a gap in the pyramid side wall which was eventually filled with rubble and is still recognizable today. This construction technique is common to all pyramids of the 5th dynasty and can directly be seen in the case of the Pyramid of Neferefre, which was left unfinished. The ruined pyramid as seen from the open courtyard of the high temple. North-south cross section of the pyramid of Sahure. Yellow: Tura limestone cladding, red: pink granite, light gray: low-grade limestone core masonry, medium gray: limestone foundation, dark gray: bedrock. The substructure of Sahure's pyramid was built in a shallow T-shaped open ditch (see above). The ditch was so shallow that the corridor leading from the pyramid entrance to the grave chamber is horizontal overall and, in parts, slightly ascending into the pyramid core. The entrance to the pyramid is located at ground level in the middle of the base of the north side. The entrance gives access to a 4.25 m (13.9 ft) long descending passageway with a slope 24° 48', a width of 1.27 m (4.2 ft) and a height 1.87 m (6.1 ft). This passageway is lined with red granite and leads to a small vestibule lined with fine limestone. At this point intruders would have encountered a red granite portcullis blocking the way to the burial chamber. Beyond this portcullis, is a slightly ascending 22.3 m (73 ft) long corridor with a slope of 5°. 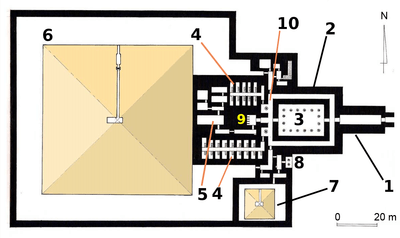 The last 3 m (9.8 ft) of the corridor are horizontal and lead to the granite-paneled door of the burial chamber, located under the tip of the pyramid. Sahure's burial chamber is oriented on an east-west axis and is today severely damaged. The chamber was so heavily robbed of its stones that it is not even clear if it comprised one or two rooms, an antechamber and the burial chamber, as was customary during the 5th dynasty. Supposing that the chamber(s) must have had round integer dimensions in royal cubits, archaeologists proposed that it was 6 royal cubits i.e. 3.15 m (10.3 ft) large and 24 royal cubits long, 12.6 m (41 ft). These values remain speculative given the extensively ruined state of the chamber. The gabled ceiling of the chamber was made of colossal blocks of fine limestone disposed in three layers. The largest blocks of the top layer were almost 10 m (33 ft) long and 4 m (13 ft) thick. Today all the ceiling blocks are broken, contributing to the overall instability of the pyramid. The last archaeologists who excavated the burial chamber in the 1960s, Maragioglio and Rinaldi, refrained from speaking there from fear that it would provoke the collapse of the ceiling. Among the rubble of the chamber, John Shae Perring found fragments of a basalt sarcophagus. No other artefacts from the original burial were found. 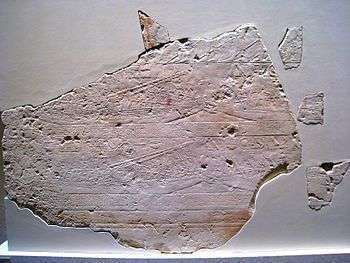 ↑ Zahi Hawass, Miroslav Verner: Newly Discovered Blocks from the Causeway of Sahure (Archaeological Report). In: Mitteilungen des Deutschen Archäologischen Instituts, Abteilung Kairo. (MDIAK) vol. 51, von Zabern, Wiesbaden 1995, S. 177–186. 1 2 Tarek el-Awady: King Sahure with the Precious Trees from Punt in a Unique Scene, in: Proceeding of “Art and Architecture of the Old Kingdom”, Prague 2007. ↑ Tarek el-Awady: The Royal Navigation Fleet of Sahure, in: Study in Honor of Tohfa Handousa, ASAE (2007). ↑ Peter Jánosi: Die Pyramiden: Mythos und Archäologie p. 80–83, C. H. Beck, ISBN 3-406-50831-6. ↑ Miroslav Verner: Die Pyramide des Sahure, in: Die Pyramiden, pp.313−324. Miroslav Verner: Abusir - The realm of Osiris, American University in Cairo Press, ISBN 977-424-723-X, 2003, Google books.